Public Gold Mining in Oregon – Where To Go? For over 150 years, prospectors have been searching for a gold mine in Oregon that contains unfathomable riches and is known as The Lost Cabin Mine. Stories of gold mining in Oregon abound with these types of legends that began with the fallout from the California gold rush. The beginning of the Oregon gold rush came when a miner from Yreka (northern) California ran into a local tavern brandishing sacks full of gold. This miner claimed his gold was from an unnamed streamed where he built his cabin. With gold fever at a high pitch, hundreds of miners left California to begin gold mining in Oregon. Not knowing exactly where to go, miners searched through the streams and mountains of southern Oregon. The Lost Cabin Mine was never found, but one of the most beautiful lakes in the western United States, Crater Lake was discovered. 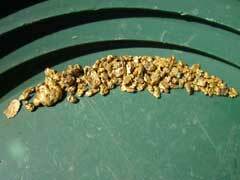 Gold Mining claims for sale abound in Oregon. Claims are registered with the state department of mines and you can acquire these claims with relative small investments. Listed in the directory of mines is a claim on Grayback Creek that was one site of the Oregon gold rush of 1851. Gold mining in Oregon would not be complete without mining on Sucker and Grayback Creeks and claims in this area are usually bid on through ebay.com. Eureka Placer Mine and surrounding claims are for sale and the description lists this mine as a thirty acre piece of paradise. Eureka Placer Mine includes the gold prospecting equipment of a trommel, excavator and a dump truck. The asking price is only $395,000. Gold mining in Oregon lists the best prospect for gold as close to the town of Bandon on Coos Bay. Beach black sand deposits in this area have produced high quality gold in placer mining concerns. North of Bandon is the Seven Devils Mine that was worked for gold and platinum and chromium. Gold mining companies are beginning to reopen these mines and are developing plans to look for gold in the old Independence Mine which was a sizable lode mine. To find more historical and working mines in Oregon travel up Coquille River to find the Coarse Gold Mine and the Salmon Mountain Mine. In the Bandon area Cut Creek is the location of the Pioneer Mine which touted a primeval raised beach terrace of black sand that is still occasionally worked for placer gold content.